Deal Book. SodaStream? You say? SodaStream sells all the hardware and flavors that we need to fizz our own from ordinary tap water, which is a lot handier than carting back and forth cases and bottles of Pepsi & Coke and their empties. Courtesy of SodaStream. smart. simple. soda. 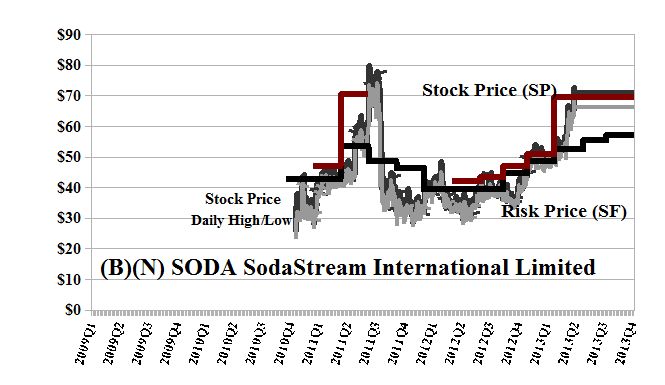 Since coming out at $30 on the Nasdaq in 2010, SodaStream has made a lot of noise of its own with steady global sales growth and reliable earnings, but still no dividends. Their first bubble burst in August 2011 allegedly on some weakness in quarterly earnings and a forecast weakness in earnings for the next quarter that dropped the stock price from $75 to $35 within two weeks (please see Exhibit 1 below) but, alas, the only failure was that the top-line sales increased by only +30% and the net income by only +100% over the year before. 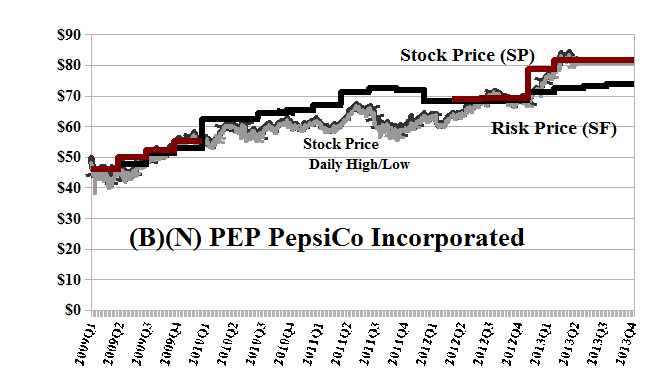 Now, there’s a rumor afoot, vigorously denied by all the parties, that PepsiCo might make a $2 billion offer for the $1.4 billion company at the current prices. Our estimate of the downside in the stock price due to the demonstrated volatility is minus (-$10) and so we would not be surprised by any price between the current $71 and $60 or $80. It’s also trading significantly above the current Risk Price (SF) of $60 which would be the “fair value” dollar-for-dollar acquisition price instead of the current $100 that people are hoping for. The July put at $70 is available for $4.80 today and we can sell an offsetting call at $80 against our long position for $3 so that for the cost of holding the stock at $70 and the collar at $1.80 per share ($4.80 less $3.00), we can ride out the indecision and disavowal until we know more. Incidentally, 40% of the stock is owned by five institutions so we don’t really know what to expect or when because 40% of $1.4 billion is just pocket-change for these folks. Maybe they don’t want to sell? SodaStream International Limited manufactures home beverage carbonation systems, which enable consumers to easily transform ordinary tap water instantly into carbonated soft drinks and sparkling water. From the Company: The company operates through four segments: the Americas; Western Europe; the Asia-Pacific; and Central and Eastern Europe, the Middle East, and Africa. It offers a range of soda makers; exchangeable food-grade carbon-dioxide (CO2) cylinders and refills; reusable carbonation bottles; and various flavors to add to the carbonated water, as well as sells additional accessories, such as bottle cleaning materials and ice cube trays. The company sells its products through approximately 60,000 retail stores in 45 countries. In addition, it distributes Brita water filtration systems in Israel. The company sells its products under the SodaStream and Soda-Club brands directly and through local distributors, as well as over the Internet. The company was formerly known as Soda-Club Holdings Ltd. and changed its name to SodaStream International Ltd. in March 2010. SodaStream International Limited has 1,600 employees and is headquartered in Airport City, Israel. PepsiCo Incorporated is a food, snack and beverage company, which manufactures or uses contract manufacturers, markets and sells a variety of salty, convenient, sweet and grain-based snacks, carbonated and non-carbonated beverages and foods.